With healthcare reform on the top of the list for politicians, providers, and patients alike, the time is ripe for multiple levels of innovation. The search for cost-saving interventions that simultaneously improve patient engagement and clinical outcomes should be one of our top priorities. One such intervention that is primed to take the spotlight is a health coaching model that relies on the integration of non-clinical staff into the primary care setting. Like any other clinical skill, to effect meaningful clinical outcomes, health coaching should be based on an evidence-based approach. Currently, motivational interviewing (MI) is the only health coaching approach to be fully described, standardized, and consistently associated with positive clinical outcomes.5-8 It has been adapted successfully in the primary care setting,9 and proven more time effective than traditional patient education.10 For more information on the utilization of MI in the healthcare setting, see our blog titled, Making the Case for Adopting the Motivational Interviewing Approach in the HealthCare Setting. Type of proficiency needed. To become an effective change agent, medical practitioners would need a different set of competencies then are typically offered in their initial or ongoing clinical training.11 Like all communication or therapeutic approaches, MI is a complex skill set that does not lend itself to a one-and-done style of training; it takes commitment, planning, and dedicated resources to train medical staff. Like learning a foreign language, it takes practice, feedback and continuous support after the initial training over time to develop proficiency.12, 13 Although a minimum competency is desirable for all staff who interact with patients, clinicians should likely be reserved for the overall medical management aspects of clinical care, while providing a warm hand-off to a fully-proficient health coach for the lifestyle management aspects. The healthcare industry in the US is in a state of flux; there are current and future challenges that include political, economic, and systemic quagmires. 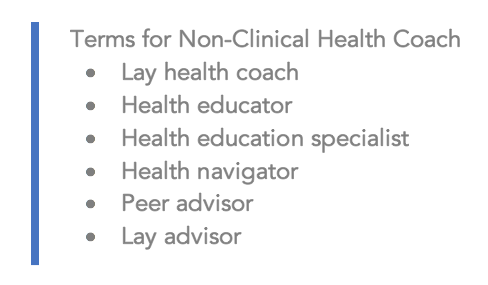 Integrating non-clinical health coaches into the primary care system is a positive and strife-free step that can be taken in any primary care setting, regardless of the current payment model. With the right implementation plan, your organization can realize almost immediate benefits for all stakeholders. 1 Brown MT, Bussell JK. Medication adherence: WHO cares? Mayo Clin Proc. 2011 Apr;86(4):304–14. doi: 10.4065/mcp.2010.0575. Accessed July 3, 2017. Available at http://www.mayoclinicproceedings.org/article/S0025-6196(11)60007-4/fulltext. 2 Rolnick SJ, Pawloski PA, Hedblom BD, Asche SE, Bruzek RJ. Patient Characteristics Associated with Medication Adherence. Clin Med Res 2013;11:54-65. doi: 10.3121/cmr.2013.1113. 3 Linden A, Butterworth SW, Prochaska JO. 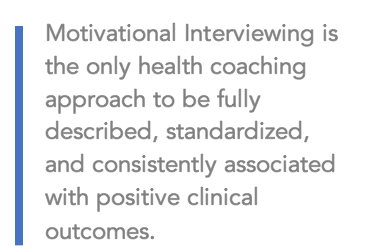 Motivational interviewing-based health coaching as a chronic care intervention. J Eval Clin Prac 2010;16(1):166-174. 4 Sforzo GA, Kaye MP, Todorova I, et al. Compendium of the Health and Wellness Coaching Literature. Am J Lifestyle Med 2017 May 19. Accessed July 11, 2017. Available at http://journals.sagepub.com/doi/full/10.1177/1559827617708562. 5 Butterworth SW, Linden A, McClay W. Health Coaching as an Intervention in Health Management Programs. Dis Manage Health Out 2007;15(5):299-307. 7 Olsen JM, Nesbitt BJ. Health Coaching to Improve Healthy Lifestyle Behaviors: An Integrative Review. Am J Health Promot 2010;25(1):e1-e12. 8 Wolever RQ, Simmons LA, Sforzo GA, et al. A Systematic Review of the Literature on Health and Wellness Coaching: Defining a Key Behavioral intervention in Healthcare. Globl Adv Health Med 2013;2(4):38-57. 9 VanBuskirk KA, Wetherell JL. Motivational Interviewing Used in Primary Care: A Systematic Review and Meta-analysis. J Behav Med 2014;37(4):768-80. 10 Lundahl B, Burke BL. The Effectiveness and Applicability of Motivational Interviewing: A Practice-Friendly Review of Four Meta-Analyses. J Clin Psych 2009;65(11):1232-45. 11 King A, Hoppe RB. “Best Practice” for Patient-Centered Communication: A Narrative Review. J Grad Med Educ 2013;5(3):385-393. 12 Miller WR, Rose GS. Toward a Theory of Motivational Interviewing. Am Psychol 2009;64(6):527-537. 13 Adelman AM. Integrating a Health Coach into Primary Care: Reflections From the Penn State Ambulatory Research Network. Ann Fam Med 2005;3(suppl_2):x33-x35. 14 Thomas ML, Elliott JE, Rao SM, Fahey KF, Paul SM, Miaskowski C. A Randomized, Clinical Trial of Education or Motivational-Interviewing-Based Coaching Compared to Usual Care to Improve Cancer Pain Management. Oncology Nursing Forum. 2011;39(1):39–49. 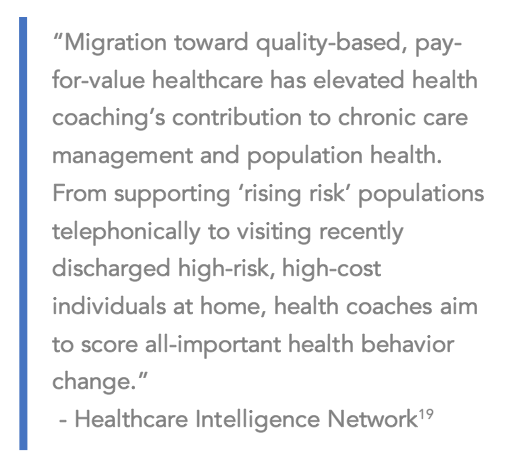 19 Healthcare Intelligence Network. 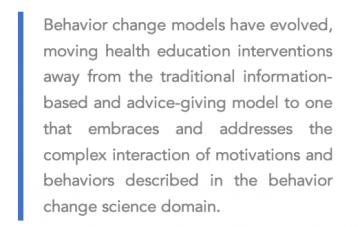 Health Coaching in 2016: Motivational Interviewing Sparks Behavior Change Conversation. White Paper 2016. Accessed July 11, 2017. Available at http://www.hin.com/library/registerHealthCoaching2016.html. 20 Chambliss ML, Lineberry S. Adding a Health Education Specialist to Your Residency – The Story: Cone Family Medicine Residency, Greensboro, NC. Accessed July 11, 2017. Available at http://slideplayer.com/slide/10333101/.